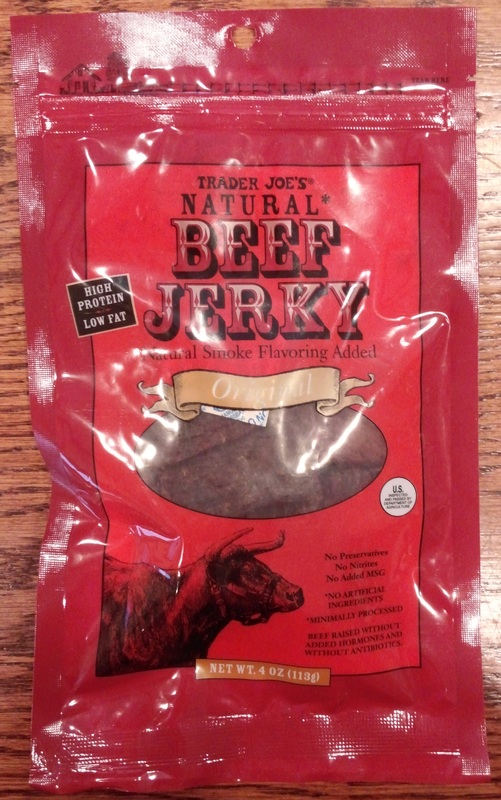 The focus of today’s Jerkyological assessment is a bag of Trader Joe’s Natural Original Beef Jerky, picked up at one of the Trader Joe’s in Silicon Valley. Taste (C+): This is foremost a sweet and slightly tangy jerky. The sugary flavor stands well above the soy sauce and apple cider vinegar flavors with a lingering bit of smokiness trailing off somewhere indistinct. It’s a pleasant flavor, but not a particularly interesting one. If you’re interested in a simple, straightforwardly sweet bit of jerky then you’ll probably be thrilled, otherwise it’ll likely land a bit on the forgettable side of the experience. Texture (C+): The jerky is slightly moist and pliable. It’s cut across the grain and is easy to tear or bite. 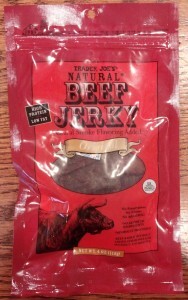 While eating the jerky is easy and generally enjoyable, it is just a bit drier than it seems it should be. As a result the meat seems to shred up unexpectedly as you chomp, with pieces staying connected at times when it seems like they should be separating. Not unpleasant at all, but not particularly remarkable either. Smell (C): The scent of this jerky is all about the soy sauce, which smells nice… still, there’s very little else in the smell. Again, nice but unremarkable. Appearance (B): This is a attractive jerky. The pieces are cut to varying sizes, ranging from a small bites to a couple of inches to a side,and have generally straight cut edges paired with natural sides. The jerky is cut a bit thick and has a dark brown color with a hint of red here and there. It has a somewhat dry looking exterior and there’s a bit of marbling here and there. They look appetizing and are one of the better aspects of this jerky. Consistency (B): This is a reasonably well-made jerky. The taste, while not particularly remarkable, is true from bite to bite throughout the bag. The moisture level of the meat is a bit variable, though not distracting at all. The thickness of the jerky is very consistent throughout the bag and the jerky looks well made. Overall Impression (C+): You often wonder if the notion of ‘healthy’ food often suggests something less flavorful and there’s cause to wonder if that’s what has happened here. The jerky is unremarkable in any way, but it is still tasty and enjoyable overall. As an opportunistic purchase you’ll doubtlessly be pleased, but it isn’t something that you’d make a special trip for. All told, it’s a nice and simple bit of meaty treatness that you’ll probably not think twice about after polishing off the bag. If you find yourself opening up your own bag after your next trek to Trader Joe’s you’ll surely enjoy it, but you’ll probably not crave another any time soon. Eat well! Tagged beef, original, smoked, sweet. Bookmark the permalink.